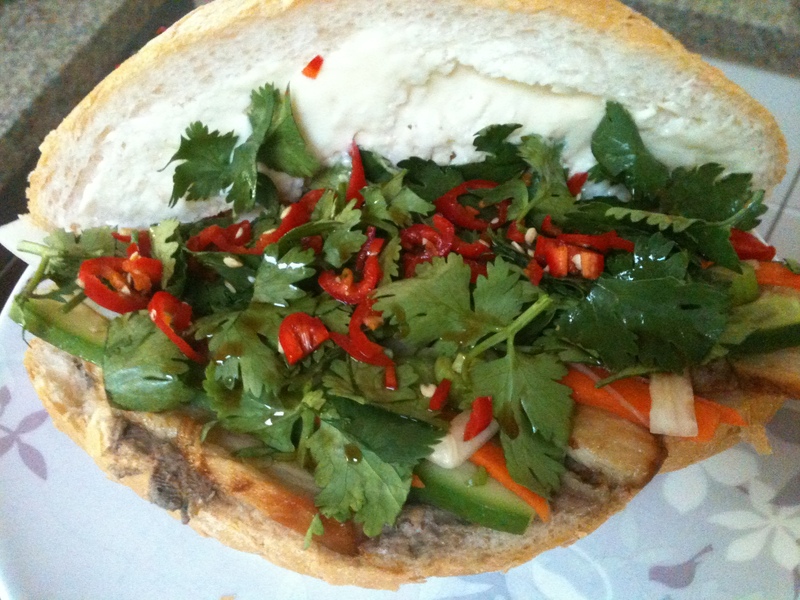 These sandwiches using vietnamese baguettes seem to be the latest craze in Melbourne. The vietnamese baguette is essentially a french baguette that is made with a bit of rice flour so it is lighter on the inside and crunchier on the outside. There are a range of options, but I made the ‘traditional’ version. Mix all ingredients in a deep oven dish, immerse the pork belly, cover with baking paper, foil and/or lid, and bake in the oven at 160 C (325 F) for 2 h. Remove from oven and let pork cool in liquid to room temperature. Remove pork and cool in the fridge before thinly slicing. If you want, slightly fry off the belly slices in a bit of oil before using. Heat the vinegar in a sauce pan and dissolve the sugar. Remove from heat. Cut the daikon and carrots into equal amounts of matchsticks and add to the pickle. Marinate and chill for at least 2 h and up to a week. Cut the baguette lengthwise (about 3/4 through, not in half), and fold open. In order, first spread the chicken liver pate, then a layer of pork belly. Add the cucumber, a handful of pickled daikon and carrot, then coriander (cilantro), spring onion / chives, and red chile. Spread the mayonaise on the top half of the baguette, and add a bit of Maggi seasoning (or light soy sauce). Enjoy! After running out of chiles, I decided to replace the Maggi seasoning with Sriracha sauce. Yum as well!